A beautful pair of Antique 14kt yellow gold earrings with hinged pierced backs featuring 2 old mine cut diamonds, est. 2.53ct (clarity:SI1 & J colour); 2 old European cut diamonds, est. 1.15ct (clarity:SI1-I1 & H-I colour) and 32 old European cut diamonds, est. 3.60ct (clarity:SI1-I2 & G-H colour). 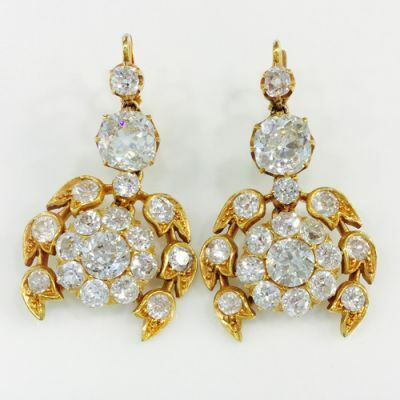 Please make an appointment to see this beautiful pair of Antique diamond earrings.